American Tower Corporation executives are pleased with the towerco’s financial performance in 2017. Company Chairman, President and CEO Jim Taiclet told brokers and Wall Street analysts on Tuesday’s earnings call: “We far exceeded our goals” for the 10-year plan. One metric — the company ended 2017 with 150,000 sites for towers and small cell systems; the goal was 100,000. AMT is launching the next 10-year plan to “deliver operational efficiency to expand” profit margins, he said. The company’s core profit-maker remains its “extensive mobile tower footprint.” Taiclet said AMT would continue to build and acquire additional tower assets that meet its investment criteria. In what officials described as an initial step at last Thursday’s FCC meeting, they unveiled an updated national broadband map to track internet speeds across the country. It’s envisioned as a key resource for consumers, policymakers and researchers. However there was disagreement among the Commissioners over whether the new map will really do that, since it only includes fixed broadband deployment, not mobile, and leaves out price. OK, so he wasn’t really talking about towers per se….or at all. As the first stage of the five-year First Responder Network Authority (FirstNet) buildout gets underway in Oregon, state officials, AT&T and FirstNet say rural deployment will not be an afterthought, reported Radio Resource Media Group. The 2018 Olympic Winter Games offer a chance for sports enthusiasts across the globe to watch the best athletes in the world showcase their talents in Pyeongchang, South Korea. This year, wireless companies are competing as well, using the Olympic Games to debut plans for the first public test of 5G wireless technology, according to a blog from Nikhil Adnani, CTO at thinkRF. The South Korean government identified Information and Communications Technology as one of its chief goals for the Winter Games, and demonstrations from several companies will show the public what it can expect from 5G technology, Ultra-HD broadcasting, Internet of Things, and virtual and augmented reality systems. The White House on Monday released a 55-page document for President Donald Trump’s proposal to overhaul the nation’s infrastructure. The plan calls for Congress to write legislation for a $1.5 trillion infrastructure package that focuses on public-private partnerships, including funding from state and local governments, reports The Hill. The plan is centered around four main goals: generating money, streamlining the permitting process, investing in rural infrastructure projects and advancing workforce training. White House officials said cutting down the environmental permitting process down to two years or less would help infrastructure deployment. The bipartisan temporary budget deal lawmakers wrangled over until the early hours of Friday morning includes $20 billion in infrastructure spending, including rural broadband. That breaks down to $10 billion for FY18 and $10 billion for FY19 – to invest in infrastructure, including programs related to rural broadband, rural water and wastewater, clean and safe drinking water, energy, innovative capital projects, and surface transportation. “This is an important step forward to help bridge the digital divide and connect the hardest to reach areas,” said USTelecom President/CEO Jonathan Spalter. Energy and Commerce Committee Chairman Greg Walden (R-OR) said the agreement “marks an important step forward” on several priorities the committee has championed for many months. UPDATE The City and the Port of Los Angeles agree with New York City when it comes to the Citizens Broadband Radio Service (CBRS) rules for the 3.5 GHz band. They want the Commission to leave them substantially the same. The subject of increasing rural broadband deployment on Tribal Lands was the subject of unusually public bickering late Friday between FCC Commissioner Mignon Clyburn and Chairman Ajit Pai. 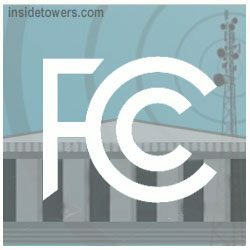 FiberTower, which is being acquired by AT&T, agreed to give up hundreds of high-band millimeter wave licenses to settle litigation with the FCC. AT&T could have used the spectrum for 5G development. As part of the agreement, FiberTower will give up all of its 94 licenses in the 24 GHz band and 595 licenses in the 39 GHz band. Additionally, AT&T agreed to pay the U.S. Treasury $27 million to end the dispute. At issue, was the Wireless Bureau’s claim that FiberTower, “had not shown that it had provided substantial service for the 689 licenses,” according to the order released by the Broadband Division of the Wireless Telecommunications Bureau. The bureau refused FiberTower’s request to review an earlier decision, saying the company “had not shown that its failure to meet the construction deadline” were due to circumstances beyond its control.